Crying at work might not mean what you think it does. A woman weeping in front of her colleagues, her clients or her boss is probably not a woman expressing sadness. She’s not displaying weakness. Instead she’s a person expressing such a fierce sense of frustration, defiance and rage that you should consider yourself lucky she’s not carrying a weapon. The recent travesty in Salt Lake City between a nurse and a police officer illustrates this point. 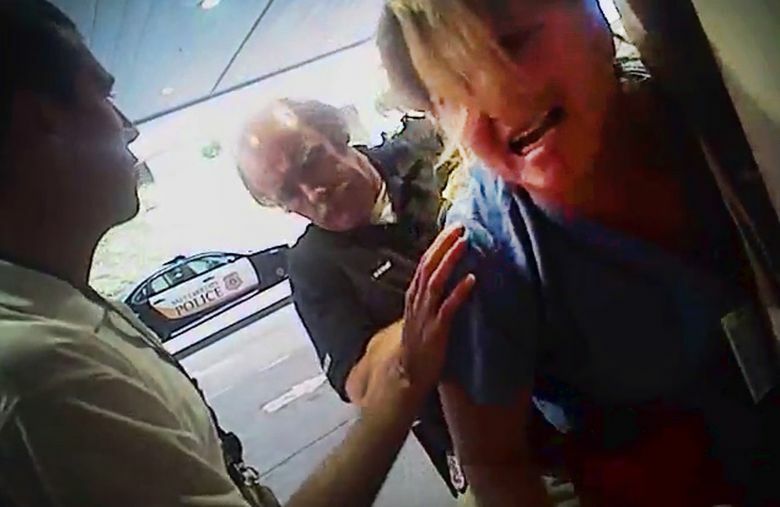 As reported in the Sept. 1 issue of The Washington Post, “Nurse Alex Wubbels politely stood her ground.” But when an infuriated detective, who resented her refusal to carry out an illegal medical procedure on an unconscious patient, seized her, pushed her out of the hospital and cuffed her, the nurse started crying and yelling. The Post’s headline begins, “ ‘This is crazy,’ sobs Utah hospital nurse.” It was the word “sobs” that grabbed my attention. True, if headlines declared, “Experienced medical professional attempts to act with civility when confronted by law-enforcement officer with maniacal need to display inappropriate masculine authority,” the story might not have gone viral. Given that the incident from Salt Lake City deserved to be witnessed by thousands — the video accompanying the article is enthralling in the worst possible way — the editors achieved the large-scale effect they sought. What the video of the altercation shows and what Wubbel’s own words, during the incident and afterward at her news conference, illustrate is that women are often driven to tears by outrage. Yes, she was sobbing, but that was because she was standing up for a principle — in this case, for the rights of her patient — and not because she was breaking down. In contrast, Detective Jeff Payne, the one grabbing and shoving the nurse, was breaking down. He was breaking into a man who could not control his emotions and instinctively resorted to inappropriate physical force. When his illegal instructions were not followed, Payne slammed the nurse’s phone out of her hand and snarled, “We’re done here.” When he couldn’t intimidate Wubbels into compliance, he lost control. Tears also signal a loss of control but unlike breaking into violence, rarely do they damage anyone except the person crying. I’ve cried at work. While the memories still evoke a profound sense of shame in me, I’ve come to understand that I had little choice over my response. I was tough, resilient and over-prepared for whatever could be thrown in my direction — or so I thought. But there were ambushes and stealth attacks, with the most hurtful of these coming from those I considered allies. The tears that swarmed into my eyes emerged not from a nest of fragility but from a stinging sense of unfairness. Unwilling or unable to express how I really felt, biting my tongue and swallowing my words made tears come into my eyes. So, given that crying is something that happens even when you are not being arrested, what are the options? A woman crying at work is not looking for pity. She’s looking for justice. When she turns those tears into words and then actions, she’s closer to making that happen. She’s simply able to see more clearly.